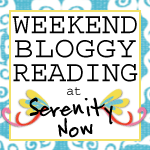 I realize that 99% of bloggers have moved on to share Halloween and Christmas projects, but I work at a slower pace. My younger daughter started back to preschool last week, so I'm still in a back to school mood! 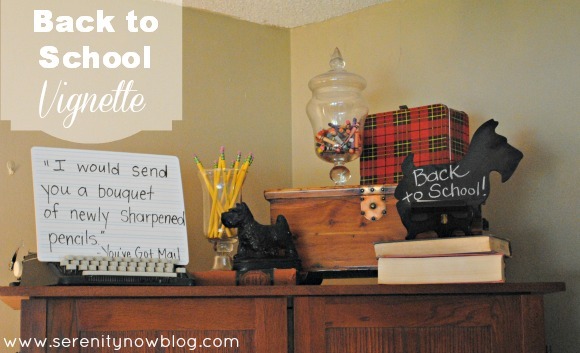 I wanted to show you a fun little Back to School Vignette I put together for the top of my TV armoire. If you're new to Serenity Now, we don't have a fireplace, which means we don't have a mantel. I use the nice flat top of my TV armoire to do seasonal decorating. I don't care if it's weird; I love shopping for school supplies: crayons, notebooks, erasers, rulers, and...pencils. Maybe that's why the You've Got Mail (love Tom Hanks) quote resonated with me so much. I have a thing for quotes. I used a dry erase marker to write the movie quote out on a "notebook paper" board from Target's Dollar Spot, and I stuck it in between the keys of my old play type-writer (I guess I was a weird kid) for display. I spotted this little Scottish Terrier in an antique shop in the Olde Towne area where I live. I think I paid around $8 for him. Thought about painting him a fun color, but I love the character he's got. And I think Emma, our Pomeranian, has a crush on him. Up top, I tossed some old crayons into an apothecary jar when the girls weren't looking, and I stuck an old yard sale lunchbox next to it. Took me just a few minutes to throw together, and I'll keep it up until the very end of the month when I pull all the pumpkins down from the attic. 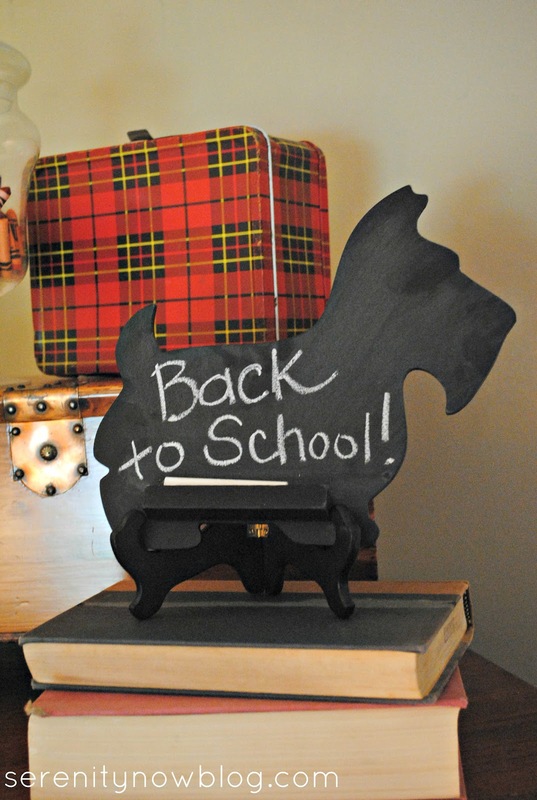 Do you do anything fun to celebrate Back to School season? So cute! I love that Tom Hanks quote too! There is just something about the smell of fall and new school supplies that takes me back to being a kid. That Scottie dog is adorable! Great job! I like that Scottie chalkboard. We have a schnuazer, but my in-laws have had Scotties for a while. The love Scottie themed gifts. I'd definitely scoop those up if I saw them. Nice finds. i work at a slower pace, too, lol, but mine is about laziness. i don't feel like going and getting all my fall/halloween bins. 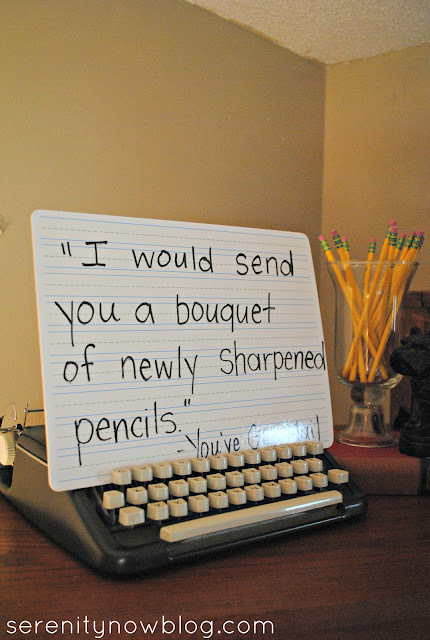 i LOOOOVE the you've got mail quote, and the typewriter/pencils set up. brilliant!! That typewritter is awesome, along with the rest of your display. My 7 year old wants to start decorating for Halloween, but it's way too early for me. I'm with you, it's still back to school season! Such a clever and unique idea!! I love the little scotties. So cute, you creative lady!! Old play typewriter! I love it! I would have been a weird kid right along with you. It looks adorable up there! 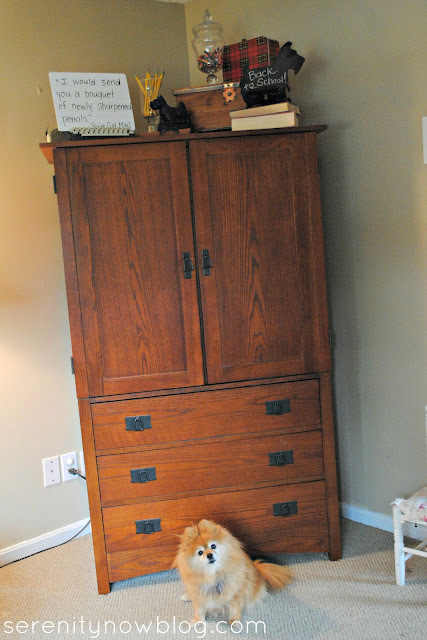 What a cute vignette! I thought your typewriter was real. I had a play typewriter when I was a kid, too. Your armoir top makes a great substitute mantel. This is great, Amanda! 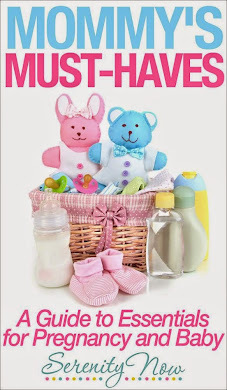 I like all the back-to-school things grouped together. I used to love to get things like guest checks and rent receipt books (with the carbon paper) and play "office." I think my little girl self would have liked your little girl self! And by the way, you've got my favorite brand of pencils there--Dixon Ticonderogas! I've got my fall stuff out, but haven't done much with it yet, did get a wreath made but that's about it so far. Too busy at work. 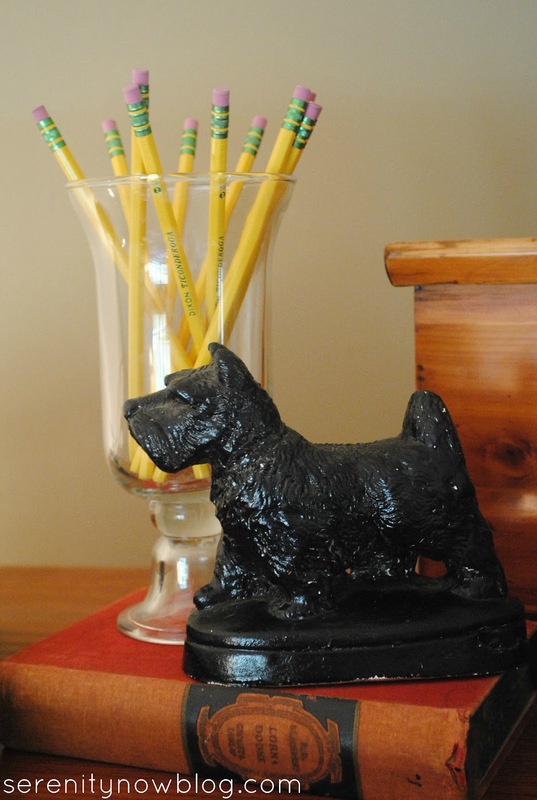 You did such a cute vignette with the Scottie dogs and play typewriter. Love it! I always love your mantels. You always have such amazing and simple concepts. I don't think I could ever pull something like this together. I think I think too busy. lol. This turned out awesome. I love the Scottie dogs and the plaid lunchbox is so cute. Love that quote, Amanda! Your display is darling! Cute, cute, cute!! Great job Amanda. =) I love the idea of a back to school vignette. I'll have to remember that for next year. I don't have a real mantel either and use the top of my hutch for seasonal displays. I'll have to get to work doing it up for Fall. Looking forward to see what you end up doing too. What fun!! 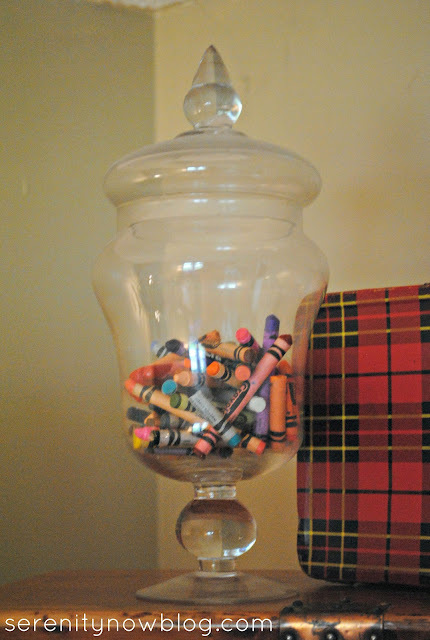 I love the crayons in the glass dish...need to do somethng like that. And the Scotties...love them!!! What a cute idea, Amanda!! I have to say I *love* your old play typewriter. So fun! what a fun use of stuff around your house to make a great vingette. I love the originality of it!! So adorable! 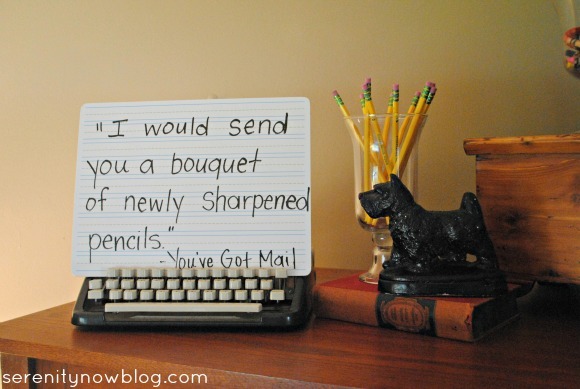 I love the "You've got mail quote" and the bouquet of freshly sharpened pencils and crayons in apothecary jars are genius. 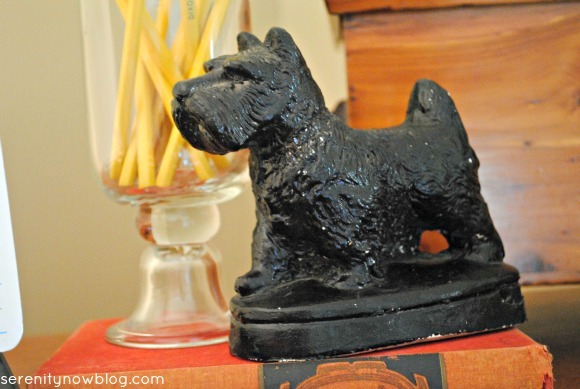 Let's not forget your adorable Scottie dog duo! Love them just the way they are and they work so well with the back to school theme. This is so cute Amanda!! 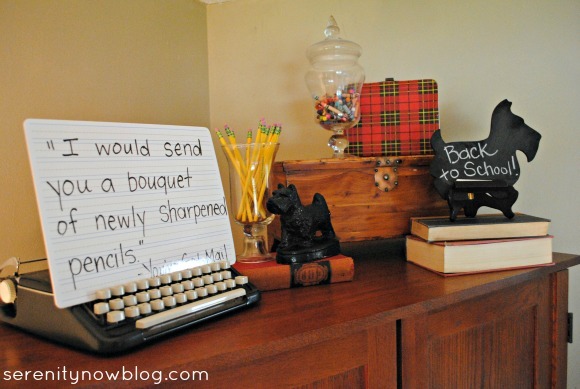 I love that quote from You've got Mail - and it looks perfect in your display! Amanda, I love the way you use this space in a mantel-like way. I know I left you a quick comment last week, but I just wanted to say again that your back-to-school display is just wonderful. I love it! Thanks so much for joining Grace at Home! I appreciate it a LOT. I love this. 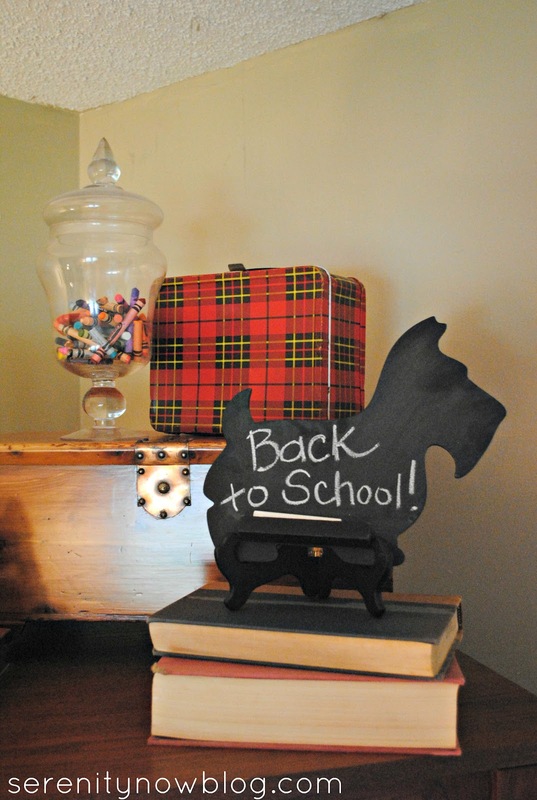 I cannot resist a vintage desk or chalkboard, so my house is decorated in Back to School mode all year around. I even have the same plaid lunchbox. Cute! I love it Amanda! Too cute!! I've never thought to decorate for back to school but you've got me wanting to now. I love the quote.